I am a mom of five, and diapers have been a big part of my monthly budget for years now. Regardless of whether I’m diapering one or two at a time, I hate to spend more than I have to. Here are the various places I’ve shopped to get the best deal on diapers — the lowest price at the time gets my business! Amazon hasn’t traditionally had the best regular price on brand-name diapers, but the free shipping has been attractive (especially when purchasing the large, bulky boxes). With the introduction of their Amazon Mom program*, I can save about 15% on the cost of a box of diapers over the regular MSRP, plus get an additional 15% off when I use Subscribe & Save. (I’m certain to either really space my shipments out to avoid overbuying or cancel immediately after my first shipment.) Amazon Mom also gives their members free membership to their Amazon Prime program, which offers free two-day shipping on ALL of your orders (which is a great bonus if you shop there often). Forget buying their diapers at everyday prices; this retailer is only worth shopping at when they have a great sale. As part of their Register Rewards program, however, you can often snag coupons for $2-5 off a future purchase or get a good buy one, get one sale. The key is to come prepared with your own manufacturer’s coupons for brands like Huggies or Pampers and combine them with Walgreens sales and the Register Rewards. This is also a great way to snag cheap wipes! Note: I stocked up on diapers for my latest baby by paying attention to deal blogs like Common Sense with Money. She tipped me off to the fact that many Walgreens stores were clearing their shelves of the Walgreens brand diapers in all sizes. I went in to my local store and asked the manager. She came out with a cart full of diapers marked down to $2 a pack! Even if you don’t like store-brand diapers, you can use these for charity or baby shower gifts! While I don’t have a CVS in my area, this scenario plays out in the same way as the Walgreens savings plan. Check deal bloggers like Deal Seeking Mom for details on their diaper-grabbing techniques. While they won’t hand out packages of diapers, the company who makes your favorite brand is a great avenue for scoring samples (which are perfect for tucking into a glove compartment or diaper bag) and high-value coupons. You can check Wise Bread’s Daily Deals for the free offers as they come available, and use your Sunday coupon inserts and Coupons.com to get $1-2 off packages of Luvs, Huggies, and Pampers. If you desire brands like Seventh Generation, you can sign up at their website for savings offers, and you should get a coupon or two in the mail. Also, don’t forget to check your favorite brands’ Facebook pages! They will often give special savings offers just to their fans! Note: Don’t dismiss the value of points programs, especially if you have twins or run a daycare. Huggies and Pampers both have points programs that allow you to bank codes found inside specially marked packages of diapers and wipes and redeem them for rewards, including coupons for free diapers! This blog is more of an aggregate of all the good diaper deals, but Baby Cheapskate is perfect for those moms and dads who don’t have time to scour the deal sites or check every location every week for the best price. In addition to listing where the deals are, the blog has some helpful tools for helping parents get every last penny out of their diapering, including the How Many Diapers Per Pack chart and Growth Charts to Predict Diaper Needs. The worst places to buy diapers have included gas stations, drug stores, grocery stores, and yes, even big box stores at times. Be aware of the price you are paying PER DIAPER to get the best price for your dollar. If you’re not brand loyal, are open to buying sizes ahead of time, and have a bit of wiggle room in your budget to stock up when the opportunity arises, you’ll never have to pay full price for diapers again. Trust me, I’ve done it! We are big fans for Target brand diapers. You can get a box for about $10, and they do a wonderful job. Are they actually any good? I've never tried Target's diapers, how many are in a box for $10? I'm a self-admitted diaper snob (Huggies Supreme), but I haven't paid more than half retail for them in many, many months. CVS and Walgreens deals are excellent when they're on. This weekend I got one pack at each store for pretty much nothing - part of that was because I had rewards from previous purchases to use, but they were each under $5 before that even. The last several months, between great drugstore deals, I have sworn by Amazon for the big boxes. At around $15 (after sales and discounts) for what amounts to 4 or 5 of the "jumbo" packs on the store shelves, with free shipping, it's hard to beat that. Parents magazine in recent months has had 20% off diaper purchases at Amazon that stacked with the 15% Subscribe and Save and 15% Amazon Mom discounts. Diapers are a pain in the wallet, but they don't have to be so bad. I've developed a healthy fear of commercial diapers. Seems like the chemical gels that hold the urine are all over the most tender parts of baby 24/7. And don't forget the amount of chemicals compared to how small weight-wise your child is. I also hear older people marvel how old we are potty training now and wonder if wet cloth made kids so uncomfortable in the past they were WILLING to train earlier. These little guys are NOT stupid. With gels and fabric like papers that keep them feeling drier, do they get the message???? Cloth may not be convenient at times, but if they train earlier how much money do you save in the long run and most of all how much healthier are our kids reproductive organs in an era where it seems everyone is on fertility drugs??? Amazon Mom has worked great for us. I'm paying about $22 for a box and having it shipped to my home. I used to buy the same box at Costco for about $26 and I had to drive to get them and would then spend more money while I was there. 18 cents/diaper is pretty good! My friend's daughter did a science project comparing a few brand name diapers to those of store brands. Turns out, Target diapers earned top reviews (scoring higher in quality and absorbency) than the expensive name brands. Target also provides great in-store coupons. 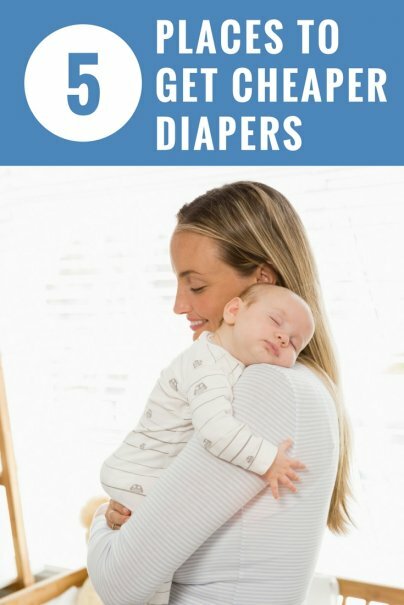 I use the website www.diapersity.com to search for diapers. It automatically finds the cheapest diapers online from a bunch of sites like Amazon. If you're trying to save money by buying diapers in bulk, it's nice to know how quickly your baby is going to be changing sizes, and how many diapers they're going to be using per day as they get older. After my wife and I had twins, I stockpiled a lot of diapers in our garage, but I ended up taking a lot of them back to Target (FYI: both Target and Walmart have pretty flexible return policies on unopened boxes of diapers, even if you don't have the receipt). Later, I found out that you can use the CDC growth charts (http://www.cdc.gov/growthcharts/) to plot out how big your baby is going to be. I hope you find it useful. If you have any questions or comments, please let me know! I'm @stephenjbell on Twitter.